Mention the ‘gig economy’ today and you are likely to get wildly different reactions. Sceptics see it as an insignificant, overhyped part of the workforce, while those on the other side of the debate believe it is a large and growing force that could change how we earn a living. These opposing views are not helped by official statistics that are typically out of date, and fail to capture economic shifts that are currently underway. To make matters worse, the lack of reliable data has led to heated arguments about whether the gig economy is the solution to widespread economic insecurity, or the cause. To be fair, the non-traditional workforce is not easy to measure. Digital platforms like Uber and Airbnb add to the complexity as do traditional income earners engaged in non-traditional work on the side. Recent studies illustrate the point. By some benchmarks, it seems like the gig economy is a dominant feature of labour markets. For instance, one in two Europeans between 15 and 24 years of age works part time or on a temporary basis (European Parliament 2016). A Brookings study also finds evidence of a clear surge in independent workers in the past decade (Brookings 2016). But other findings play down the importance of the gig economy. A recent report from the Resolution Foundation found that after accounting for seasonal differences, the proportion of workers doing multiple jobs is at a record low in Britain after reaching a peak of around 5% in the mid-1990s (Resolution Foundation 2016). At the McKinsey Global Institute, we tried to fill the gap in data. We focused on measuring the independent workforce across the US and Europe and conducted an extensive survey of more than 8,000 respondents in the US, the UK, Germany, Sweden, France and Spain (McKingsey Global Institute 2016). Our findings may help explode popular myths about independent workers. First, it’s important to recognise that independent workers share three defining characteristics: they have a high degree of autonomy; they get paid by task, assignment, or sales; and they have short-term commitments to their clients or customers. Independent workers provide labour, sell goods and rent assets, and they include sellers on digital platforms like eBay and Etsy, micro-landlords who rent rooms on Airbnb, and freelancing physicians, lawyers, web designers, and writers. Based on this definition, we found that the independent workforce is considerably larger than government statistics indicate. Our research concludes that 20-30% of the working age population have spent time as independent workers. Extrapolating this to the US and 15 core EU countries, that’s as many as 162 million people, with up to 94 million in the 15 core EU countries alone. Government statistics show roughly half that headcount, putting the independent workforce at a mere 11% of the working age population in the US and 14% in the EU-15. 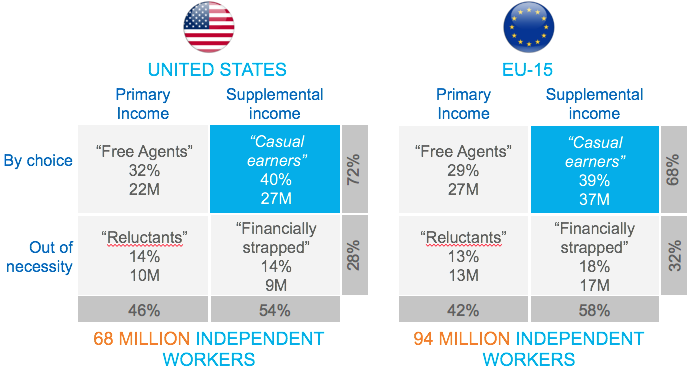 The difference primarily comes from the fact that more than half of this non-traditional workforce is engaged in independent work part of the time, and also that, in recent years, the gig economy has indeed grown, but still represents only 15%, or about 24 million, of the independent workers in our study. About 9 million out of that 24 are exclusively using digital platforms for their independent work – a little less than 40% – while more than 60% are combining both digital and non-digital means to perform their work. Unlike previous studies – such as one focused on Austria (Huws and Joyce 2016) –we also have examined why people engage in independent work. Our findings are surprising. The vast majority of independent workers, about 70%, whether primary or secondary job holders, say they engage in independent work by choice, preferring greater autonomy and flexibility than traditional jobs typically offer. And the majority of this group are indeed casual earners, using independent work to supplement other sources of income. Casual earners typically include students, retirees, or caregivers who combine work with other responsibilities and activities as well as some in traditional jobs, supplementing their income. And this segmentation is relatively stable between continents, e.g. contrasting US and Europe (Figure 1). 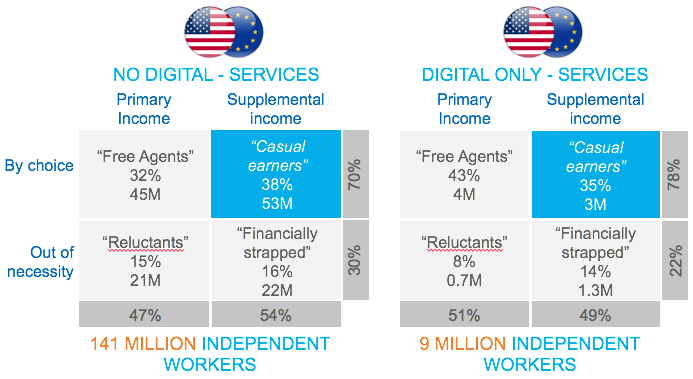 Comparing the sub-sample of only-digital versus non-digital independent workers, digital workers are even more likely to be independent by choice (78%), but slightly less likely to rely on their independent work as their primary source of income. The gig economy does indeed seem to boost self-employment (Figure 2). People who chose to work independently report higher levels of satisfaction, and not only because of greater work flexibility. More are engaged in their work versus traditional job holders, relish being their own boss, and enjoy greater creativity than typical nine-to-five workers. Overall, they are happier with their level of income and report being just as satisfied as traditional workers on issues like income security and benefits. Unfortunately, that still leaves 30% of independent workers who have no choice but to work independently. While they are a minority they tend to be more typically associated with the independent workforce. This group can be split into two categories – those who derive their primary income from independent work but would prefer a traditional job, and the financially strapped who would prefer not to work on the side but are forced to in order to make ends meet. While we found most characteristics of independent workers were shared across our group of 15 European countries, there were some variations. At one end of the scale were Sweden and the UK, with 74% choosing independent work versus 26% working independently out of necessity. At the other end we found Spain with 58% working by choice and 42% out of necessity. The highest shares of independent workers were found in Greece, Italy, Portugal, and Spain, where incomes are lower and economic growth persistently weak. In these countries, some 15 to 20% of the workforce is self-employed or in temporary employment. In some European countries, including Greece, Spain, Portugal, the Netherlands, and Portugal, more than three-quarters of temp workers are involuntary. Our findings have significant implications for policymakers, companies, and individuals alike. Today, it is no longer sufficient for policymakers to focus on workers in traditional jobs. The independent workforce has become too big to ignore. Second, policymakers need to do a better job of tracking the independent workforce by collecting up to date and more comprehensive data. Third, policymakers must expand job opportunities for independent workers who prefer traditional employment. Finally, pressure will grow for policymakers to address gaps in worker protections, benefits and income security. Companies will also face competitive pressures to develop systems and processes to effectively manage a blend of traditional employees and independent workers. And the race will be on for technologists to innovate, finding new ways to connect individuals to paid work. Individuals will also face pressure to adapt. Independent workers will have to navigate the risks and challenges of non-traditional employment, particularly periods of income uncertainty, and learn to think of themselves as their own small business, finding ways for continuous improvement and skills development. But there could be significant economic upsides as well. By tackling some of the challenges of a changing workforce, our research shows we could create a happier, more satisfied, and more efficient workforce overall. And that’s something worth working towards. Brookings (2016) Tracking the gig economy, October. European Parliament (2016) Precarious employment in Europe, Part 1: Patterns, trends, and policy strategy, July. Huws, U and S Joyce (2016) “Crowd Working Survey: Character of Austria’s gig economy revealed for the first time”, University of Hertfordshire and Ipsos MORI, in association with the Foundation for European Progressive Studies, UNI Europa and AK Wien. 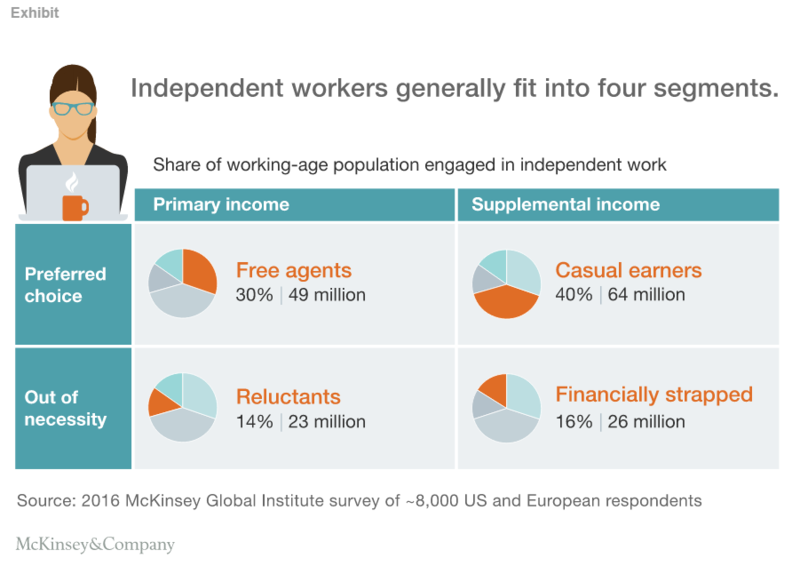 The McKinsey Global Institute (2016) Independent Work: Choice, Necessity and the Gig Economy, October. Resolution Foundation (2016) Double take: Workers with multiple jobs and reforms to National Insurance, November.